A normal investigation into Travel Channel's paranormal investigators reveals they are Kindred Spirits. Kindred Spirits season 3 premieres on Thursday, January 24 at 10 p.m. on Travel Channel. You're never alone when you grow up in a haunted house. This could lead to embarrassment as you hit adolescence, but unless there's serious poltergeist activity, the experience is usually fairly mundane. However, when the spooks get nasty and the next Ghostbusters sequel means Venkman and his crew are otherwise preoccupied, you'd be well advised to seek out Kindred Spirits. Season 3 is coming to Travel Channel and paranormal investigators Amy Bruni and Adam Berry have been known to cross the country when haunts get too familiar. 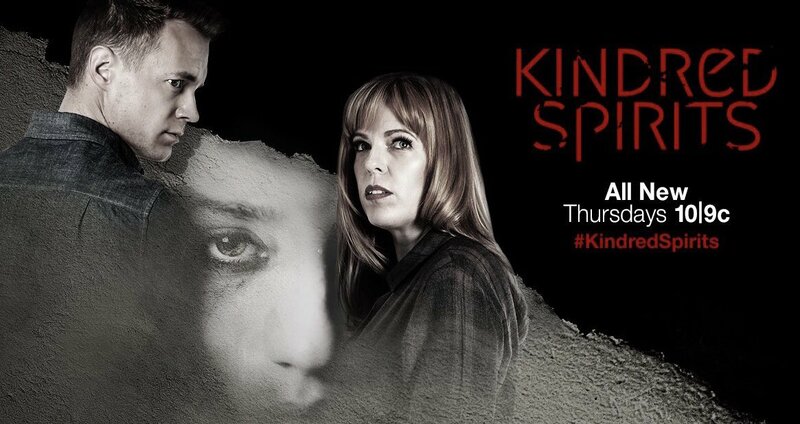 Bruni and Berry haunt the ghosts on Kindred Spirits, which premieres season 3 on Thursday, January 24 at 10 p.m. They materialize at "evil and historic locations" throughout America to scare negative manifestations away with positive vibes. The season debuts at a compound that housed an orphanage, but the duo also delve deep into asylums, homes inhabited by aggressive entities and the battlefields of the Civil War this season. With special guests like psychic medium Chip Coffey and paranormal researcher John Tenney, Kindred Spirits reconstructs the faded stories of the dead. Amy Bruni has been doing this since she was a kid and went out on paranormal excursions with her dad. She's traveled the country to visit its most haunted places, researching the group dynamics of ghost-hunting teams and lecturing on the history of paranormal investigation. Bruni met Adam Berry when she was the historical researcher for seven seasons on Syfy’s Ghost Hunters. Berry’s paranormal interest was sparked by an experience he had in Gettysburg, Pennsylvania. He founded his own investigation team in 2007, to document cases of strange activity. Kindred Spirits season three opens with a one-hour episode exploring restless spirits at the site of the Odd Fellows Compound in Liberty, Missouri. The Odd Fellows Home is well known in the area. The District includes a home for the elderly, a hospital, a school and a cemetery where 600 people are buried. It is also the home of The Belvoir Winery, which throws wine tastings, weddings, and other events. Visitors have spotted ghosts of an old woman singing and a mischievous man on the property. They sometimes hear the sounds of children playing. More than 10,000 people died on the property. Now their pain has fostered a malevolent entity which sets off low-level demonic frequency registers in the experts' arsenal of paranormal detectors. Amy and Adam spoke with Den of Geek about ghosts and spirits, including the exquisite wine at The Belvoir Winery, which they assured us isn't haunted with anything but a delicious aftertaste, before giving up the ghosts. Den of Geek: How prevalent was the mythology of the Odd Fellows home and compound in the town when you first started doing the investigations? Amy Bruni: Oh, that place has been rumored to be haunted for years. Even before Jesse and his family purchased it. I have some friends that grew up in the area, and they remember being in High School and breaking into that place and looking for ghosts. I think it's long been rumored to be haunted. Especially, if you just look at it, it's a very foreboding set of buildings. Once you get inside, especially now the renovated building is just gorgeous, but the other ones, that's one of those places we call "It ought to be haunted." You see it and you're like, "That ought to be haunted." Adam Berry: Yeah. Also, we met a lot of people that were connected to that building before Jesse and his family took it over. We spoke to one woman specifically, who was a kid in a classroom in the orphanage part, and everything else was run down and a bit dingy, but there was one room upstairs that they still used as a classroom, and she was a student there. And they all said that they had weird experiences going to school there and it's interesting to see, how many "lives" this building has had, so that energy sticks around a little and stories accumulate. You've also explored killings and sites of murders over the past few seasons, so I'm wondering what it is that actually scares you? Amy: For us, I think the one time I was actually nervous, even this season. We were assisting a family where the woman felt she was cursed. Twice actually, there were two cases like this. Where the people felt that the people around them, were being affected and dying and getting in accidents and things. And I remember looking at Adam once, going, "should we be worried?" That was a moment where I definitely felt a little nervous. It was one of those things where we didn't necessarily believe that this was the case, but there was this "what if?" Adam: Right. And I think we also get a little nervous if something is messing with you or playing with you, or not giving you answers. Just poking you and poking the beast, as it were, I feel like that's a little unnerving because you don't really know what you're dealing with, because a) you're not getting solid answers, and b) you have to figure out what it is. You have to continue to prod and continue to look. And if it's just messing with you, it can be a little bit intense. You've done these explorations so many times, do you think you might go into these spaces, expecting to be scared and push different energies? Amy: Adam and I have long speculated that there's something about our energy, in general, that brings things out. I don't know if it's because we have done it so much, that we approach it differently or there's a comfort level when we walk in, that some people don't have. But that whatever is there feels more like they can interact with us. I think there is something to that. We never expect anything to happen. If anything, we expect things not to happen. Most of the time we find other reasons for activity or we find explanations, and, so we go in with the opposite idea. Adam: Yeah. For sure. I think when you go in with expectations, you get it wrong. I think you get it wrong if you go with expectations. Because something will happen, you automatically assume that it's a ghost or it's negative or it's bad. And if you go in expecting nothing and you get something, then that's more concrete I think, than going in and thinking, "Oh, this place is already haunted. Let's go in." Of course, the people that we're going in to help, they have had experiences and so it's our job to wade through that and be like, "Okay. What experiences can we explain away and what are things that we really need to focus on, to figure out what is this haunting." Tonight on the premiere of #KindredSpirits you never know who will show up.